Happy National Egg Salad Day. This holiday traditionally falls on the day after Easter, when your beautifully decorated Easter eggs have suddenly morphed from being an example of amazing creativity into a food product with an expiration date. Here are a couple of eggs we decorated at our house that I wanted to share (artistic shout outs to Maeve Bradley and Jesse Bradley). We are no longer satisfied with using dies and stickers. For these pieces we cut out shapes with X-Acto knives and hand painted details with fine brushes. 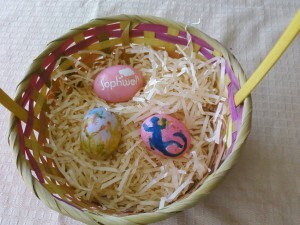 To get the Sophwell logo, I printed out the logo on a label, stuck it to the egg, and then cut around each letter, I dipped it in the dye, dried it and pealed off the remaining label (click on the photo for a larger version to see more detail). Now that Easter has passed and I have posted the picture to the web, I think the best use for this one of a kind egg would now be… lunch. So what’s your favorite egg salad recipe? Post yours in the comments section below.